Quick Connect is the Next Gen Contacts app. Now CALL / TEXT / EMAIL / WHATSAPP/ FACETIME / MESSENGER / SKYPE - All in one place. 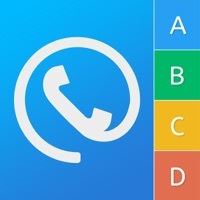 Speed Dial - Dial a contact with a single tap. If there are more than one number for a contact you can set a speed dial. Organize Contacts in folders - You can easily organize your contacts in folders. E.g. Family/Friends/Emergency etc. Or you can create your own folders as well. Secret Folder - Move your private contacts to this folder. This folder is password protected. Filters - Show contacts only have phone numbers / Show contacts only have emails. We are using phone Contacts as the source database. So any edits in the Contacts app will reflect directly on the Quick Connect app. No contacts are saved privately except the secret folder contacts. Facebook Messenger / Skype / WhatsApp will be displayed only if the corresponding apps are installed on your device.